Jdp Econ Publications, 9780974533872, 248pp. How do the players of today compare to the players of yesterday? How do your favorites on your favorite team stack up in the regular or postseason in batting and pitching? Which season was the best ever? Who had the best career and which player of today is moving up the best ever rankings and how far? 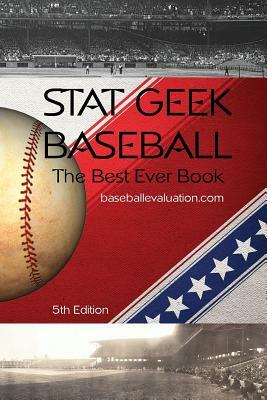 The 5th edition of Stat Geek Baseball, the Best Ever Book, from the staff of baseballevaluation.com, takes on these questions and more, updated through the end of the 2013 postseason. Where do the seasons of Clayton Kershaw rank on the best ever Dodger list? Has Mike Trout cracked the Top 20 of Anaheim territory on their career best batting chart? There are Top 20 lists for best seasons and careers for every team in history, including the past teams from the American Association and National Association and others, plus the American League and National League. Think Keokuk Westerns, Providence Grays, New York Yankees, Boston Red Sox, Minnesota Twins, St. Louis Cardinals, Atlanta Braves, and the other twenty-five current Major League franchises as well. There are also overall lists for the best player and pitcher and team. Yes, it's Stat Geek Baseball, the Best Ever Book, counting down the best ever in the history of baseball.